If you’re engaged in B2B lead-generation-focused marketing and you’ve got a limited marketing budget, you’re probably trying to decide how to allocate your funds so that you can get the most qualified leads. One of the main criteria for making this decision is the conversion rate for each marketing channel you have under consideration. Before we go any further, let’s define what a conversion rate is. In digital marketing, it’s usually the rate at which a website visitor becomes a lead, essentially by filling out a form to share their contact information with the understanding that you will continue to market to them. Conversion rate can also mean the rate at which these leads become marketing qualified leads, then sales leads, and finally customers. In essence, “conversion rate” is a generic term that tries to describe the rate at which customers take the actions you want them to in order to progress from one stage in the marketing funnel to the next. So, for example, let’s say you have 10,000 website visitors per month and 300 of them sign up to receive email updates from you. You’ve got a conversion rate of 3% (300/10,000). Of course, a marketing channel’s conversion rate is not the be-all end-all when it comes to deciding where to allocate your marketing budget. Other factors, such as cost per lead and lead volume definitely need to be part of the decision-making process. For instance, attending a trade show is usually a costly endeavor and doesn’t yield a huge number of potential leads. So while contacts made at a trade show may have a high conversion rate when it comes to turning them into leads, prospects yielded by trade show activity will likely end up with high costs per lead. On the other hand, while social media advertising may have a relatively low conversion rate, it is also much less expensive than mounting a trade show and has a much larger reach, meaning that it has the potential to deliver more leads for a lower cost. But when it comes to looking at your digital marketing mix, where all marketing activities are relatively inexpensive and conversion-rate data is abundant, comparing channel conversion rates can be an effective way to help decide which channels you want to emphasize. Typically, a B2B integrated marketing program will include some sort of inbound SEO program, a social media presence, online advertising, and a referral strategy to attract prospects to a company’s website and start them on the journey to becoming customers. Once a potential customer has signed up for a promotion on a site’s landing page, they are enrolled in a company’s ongoing marketing communications program, entering the “middle-of-the-funnel” marketing phase where they can be marketed to using a combination of email marketing and content marketing, as well as ongoing social media and online advertising. Let’s take a look at what some reputable sources are saying about the conversion rates for each type of digital marketing channel employed during these two main stages of the buying cycle. A few years ago, MarketingSherpa did a study to determine the average website conversion rates by industry. Their study found that the average conversion rate for a website in the manufacturing industry — i.e., the rate at which an anonymous visitor fills out a form to identify themselves — is 4%. This is in contrast to, say, the financial services sector, which converts at 10%. 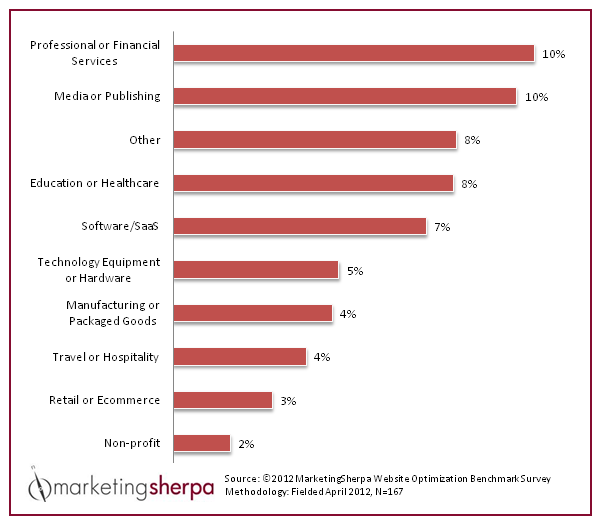 Conversion rates by industry, from MarketingSherpa’s 2012 study. Courtesy of MarketingSherpa. MarketingSherpa’s industry-specific data affirms something we all know — that conversion rates in the industrial sector are low when compared to other industries. Per the study, only the retail and the non-profit sectors are more challenged, with 3% and 2% average conversion rates, respectively. Unfortunately, the MarketingSherpa study does not go on to break down its average conversion rates by channel. Marketo, the B2B marketing automation platform, however, did conduct such a study by analyzing its 4,100+ users‘ account data. While this information isn’t specific to manufacturing or the industrial sector, it does provide some instructive information about which channels perform the best when it comes to conversion rates. Inbound strategies, including onsite and offsite SEO and blogging, yielded an average conversion rate of 3.82%. Paid marketing, or online advertising such as search pay-per-click campaigns, resulted in a 2.98% conversion rate on average. Social media clocked in at 1.95%. The Marketo study also includes conversion rates for offline lead-generation strategies such as sales prospecting, events, and referrals. Sales prospecting — i.e., the traditional cold calling or pounding the pavement — averaged a 0.90% conversion rate. Event-based marketing, such as trade shows, came in at 1.48%. Referrals were far and above the best of any lead source, with a conversion rate of 10.99% (no surprise; word of mouth is still the best source of new prospects and customers). Marketo also included email and nurturing campaigns in its report, which Marketo’s marketing automation platform is primarily used for. Per their report, these channels have conversion rates of just 0.55% and 0.58%, respectively. Conversion Rates by channel for Marketo users. Courtesy of Marketo. These statistics, though, are just for top-of-funnel conversions. Email and nurturing campaigns, of course, are designed to usher already-identified prospects down the lead-conversion funnel toward sales. In other words, email and nurturing are middle-of-the-funnel marketing techniques that no business should rely on to fill the top of their funnel. When it comes to converting leads into sales, the marketing mix that helps make these sorts of conversions happen is substantially different than the top-of-funnel techniques. According to Ifbyphone’s 2014 Marketing Measurement Report, 35% of 551 survey respondents said that in-person visits close the deal and 20% said that inbound calls do the trick. No surprise there; these are the areas where sales has traditionally excelled. When it comes to generating leads that are qualified for sales attention, though, Ifbyphone’s survey indicates that digital marketing channels are preferred among most marketers over trade shows and direct mail. Email marketing leads the pack with 57% saying they preferred it, followed by SEO and PPC (55%) and social media (44%). Trade shows come in at 39%, followed by direct mail with a 26% approval rate. 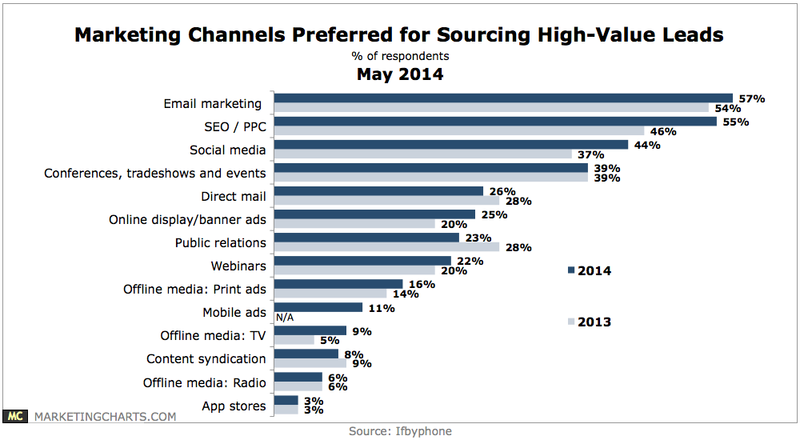 The results of Ifbyphone’s study of the approval ratings for marketing channels that convert the highest-quality leads. Courtesy of Ifbyphone. If you use the Marketo and Ifbyphone reports as bases, you’ll conclude that a digital marketing program can be optimized to convert initial contacts into sales-ready leads by building an integrated marketing program that combines an inbound strategy, online advertising, social media, and email marketing. Use inbound techniques such as blogging and SEO (3.82% conversion rate per Marketo), combined with online advertising (2.98% conversion rate per Marketo) and social media (1.95% conversion rate per Marketo), to attract visitors to your website and convert them into known prospects. Then, nurture those contacts into qualified leads using email marketing (57% prefer per Ifbyphone), PPC ads (55% prefer per Ifbyphone), and ongoing social media engagement (44% prefer per Ifbyphone). Throughout, don’t forget about the content you’ll need to drive your inbound and lead nurturing programs. Of course, it’s going to be a little more complicated than that, but these reports at least provide a framework to get you started. To take your planning to the next level and decide how much you should be spending in each area, download our Industrial Marketing Budgeting Guide.